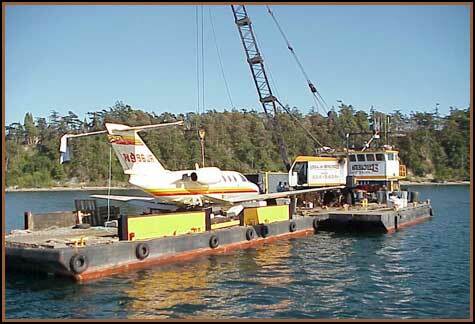 On 21 July, 2003 this Citation jet ditched in Penn Cove at the start of Whidbey Island Race Week. The Penn Cove mussel farm employees along with the Race Week Committee boat picked up the two people who were on board and their dog. No one was hurt and the plane received only minor damage considering the forced landing on water. Marine Services' Captain John Aydelotte was Salvage Master and prime contractor calling in a barge and crane from Seattle with a hard hat diving module on deck. Black Water Marine and Fidalgo Dive Services were sub contracted. Together they located and recovered the Citation in only three days. The aircraft was barged to Seattle where the wings were removed and the total unit was sent to Colorado for salvage. All were delighted with the expeditious recovery.